It comes along with everything you need to go hunting right away. Its high velocity makes it an excellent choice for hunters of game big or small. The simple setup adds to the overall convenience. Some users report that the cable slide feels cheap, and it is one of the components of the bow that don’t seem up to par with the rest. When a compound bow is advertised as being mainly for hunters, you might expect it to be more difficult to use and to set up. None of these is true when it comes to the Bear Archery Species RTH. As the manufacturer says, this one is ‘ready to hunt’, and that includes the fact that you don’t need to dedicate your time to complicated assembly and to work out other glitches. Sold in the same package with six Trophy Ridge accessories, it is the complete solution to any hunter, novice or seasoned, to make the best of the next adventure he or she intends to attend. One thing you want from your compound bow is excellent construction. When you are out on the field, and you take aim at your prey, your line of sight must be clear, and your arrow must reach its destination without fail. 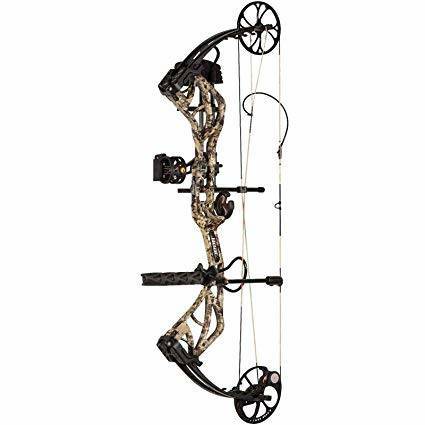 A good quality bow helps achieve your goals, and this model is built to fit the bill. The limbs are made from a unique material called EnduraFiber. As you draw your bow, the limbs prove to be extra flexible, making things easier for you. At the same time, they are rigid enough to regain their original shape and also to send your arrows flying as fast and as far away as you need them to. The overall construction is a testimony to the overall quality of this bow. Many hunters prefer it for costlier alternatives, and a novice hunter will do well with a compound bow that behaves so well out of the box. If you are looking to make a sound investment, you are looking at the right option. 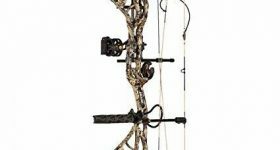 A compound bow that is designed for right-handed shooters, the Bear Archery Species RTH offers a plethora of design elements that will convince you that it is worth the money. The customization options are not as generous as what you can see in other compound bows available, but this model does not aim for being an option for any shooter. This one is designed for hunters, and that is why its draw weight can be adjusted only between 55 and 70 lbs. From one axle to the other, the bow measures 31”, another sign that this model is intended for people who want to become bow hunters or are already seasoned in this field of activity. As you might already expect, this model is heavier than others. At 4 lbs, it may not be easy to manipulate, but it will challenge you to become better and learn how to handle it. Balance is essential for a hunting bow, and the manufacturer proves that it knows this. The let-off is 80%, so there is enough compensation for pulling the string. The reward is also there; the maximum velocity for your arrow is 320 feet per second, so each one will reach its target, as you hone your aiming skills. Available in Kryptek CamoDraw pattern, it is a nice looking bow that also performs well. Seeing that the moment is here to talk about features, let’s look at what else makes this bow such a good deal. The accessories included are a good reason to consider this model. There are six Trophy Ridge accessories provided with your purchase, and they will make your life easier. A 4-pin sight will allow your aim to become more accurate, while the whisker biscuit arrow rest is among the best that can be found right now. A quiver, as well as a peep sight and a nock loop, are also provided. The great thing about the fact that you get these accessories is that you don’t have to purchase them separately. The single cam system is smooth and helps you achieve the results you desire. Also, the RockStops feature ensures a solid back wall so that each shot you launch doesn’t make the rebound difficult. Other things that must be mentioned here are the low down pockets. Proper alignment of the limbs to the pockets and into the riser is possible because of this system. Two important features make this bow such an excellent option for people who need to count on noise reduction in their hunting gear of choice. The limb dampener system installed on the bow makes sure that you will not have to worry about vibrations. The Shockwaves technology employed is, therefore, a plus. Also, the limb boot design holds the limbs in place so that no noise and vibration occur when drawing your bow and on release. If you want a ‘ready to hunt’ compound bow, you will do well with the Bear Archery Species RTH. Created with the needs of hunters in mind, this model may be less versatile than others, but, at the same time, it offers fantastic reliability, as well as high efficiency. Capable of reducing noise and vibrations, while featuring high velocity, and sporting perfect alignment, it is a well-balanced compound bow that will make your hunting adventures something to look forward to. As the package includes, besides the bow, some useful items like a whisker biscuit arrow rest, and a peep sight, you won’t need anything else.